Real Lads Love Cats Calendar is on pre-order now! The "Real Lads Love Cats" Calendars are on pre-order now! 13 sexiest men of Ireland with their feline friends! These men have heart of gold and their cats are fluffy! Order now to avoid disappointment, these are limited edition. Once it's gone, it's gone! Click on the image to read the full post! We are on College Times! We are on Lovin Dublin! SureFeed is a microchip pet feeder from Sure Petcare. It makes sure every one of your cat gets the food it needs, without anyone else eating it all. This innovative, beautifully made feeder recognises your pet's microchip or the SureFlap RFID collar tag (1 included) and it only opens for authorised numbers. It is the perfect solution for multi cat households where it can be tricky to ensure all your cats get their fair share. And if one of your cats needs a special diet or medication it's a great way to restrict access to food. It is also a great way to stop the dog or toddler (!) eating the cat's food! It is simple to scan your cat's microchip into the SureFeed. Once the number has been learnt it is stored. You can store up to 32 individual microchip numbers. The lid will only open for microchip numbers it recognises. When your cat has finished and moves away from the feeder the lid closes. You can adjust how quickly the lid closes. The bowls are designed to work specifically with this feeder. They have an integrated seal around the top which helps to keep food fresher for longer. Intercom is the Irish representative for Sure Petcare. Full range of SureFeed products can be seen at Interchem stall. It's not very often we get to see so many amazing latest cat products under the same roof! What are you waiting for? Go grab your ticket now! Our WELCOME pack has cat food samples, exclusive discount code for only this fair, gifts and so much more. It worths more than the ticket price itself! SureFlap is a microchip cat flap from Sure Petcare. It is a revolutionary, battery-powered cat flap with a built in sensor which works with your pet's existing unique identification microchip and prevents other animals from entering your home. Alternatively, it can be used with SureFlap RFID collar tag, one of which is supplied with the product. It has an LCD display on the top of the product for easy programming. Intercom is the Irish representative for Sure Petcare. Full range of SureFlap products can be seen at Interchem stall. Using feline natural reassuring messages, FELIWAY® helps your cat happily adjust to pace of modern life, ensures full happiness and avoids signs like urine spraying, scratching, fighting and hiding. The pheromone released by FELIWAY CLASSIC is the exact copy of the familiarisation facial pheromone that cats leave naturally by rubbing their cheek against an object or people when they are feeling comfortable in their environment. The pheromone released by FELIWAY FRIENDS is the exact copy of the natural comforting pheromone released by the mother cats’ mammary area during the nursing period. This appeasing pheromone helps maintain the cohesion between the kittens and their mother. The pheromone in FELISCRATCH by FELIWAY® is the exact synthetic copy of the pheromone released by cats’ interdigital area when scratching. Cats mark their territory by leaving this chemical olfactory message, combined with the visible lacerations on the scratched surface. Interchem is the Irish representative for FELIWAY. Full range of FELIWAY products can be found at the Interchem stall at Dublin Cat Fair. Interchem (Ireland) Ltd is a leading Irish distributor of animal health products which has served the veterinary industry for almost 50 years. Interchem’s quality range of products, many of which are market leaders in their segment include pharmaceuticals, biologicals, pheromonatherapy and animal nutrition. Intercom is the Irish representative for Feliway and Sure Pet Care. Come to their stall at the fair and check out all their full range of Feliway products, Sure Flap, Sure Feed and many others! Concerned about your cat's safety outside? Or, do you have an indoor cat who you'd like to benefit from the enrichment of a safe outdoor territory? At ProtectaPet, we have found the optimum balance between feline welfare and cats' safety outdoors. Our fencetop barriers, fresstanding cat enclosure fencing, catios and cat balcony enclosures, provide cat owners with the peace of mind they have been longing for. Our UK designed and manufactured cat containment products are available in DIY kits or you can opt for professional installation. Come and see us to discuss the possibilities for you and your cat. The Moggie Motel was Ireland’s first cattery to be listed with International Cat Care (formerly FAB). We endeavour to ensure that your cat is as happy being cared for by us as it is at home. Owner Audrey Furlong is not only a cat lover herself, but she has also dedicated much time to furthering her knowledge of pet health, welfare, nutrition and behaviour. She is also a professional cat groomer, she has received specific training in the UK. Our vision is to help create a world where every cat is cared for. We are a not-for-profit cat rescue (registered charity no 20105297), based in Dublin’s north inner city. Our mission is to help homeless, stray and feral cats and kittens through our Trap, Neuter, Return (TNR), rescue, fostering and rehoming programmes in conjunction with our educational and advocacy work. Since forming as a group of unpaid volunteers in August 2014, we have TNR’d over 1,000 feral cats and we have rescued, tamed and found loving forever homes for over 1,000 kittens. We have provided veterinary treatment for many more and we have rehomed a number of domestic cats who have been surrendered to us by their humans for a variety of reasons. Local vets tell us they have seen a dramatic reduction in the number of homeless cats and unwanted kittens in the area since we started our work. We run cat welfare awareness events in various pet stores across Dublin. We also run regular low cost microchipping days as part of our responsible pet ownership initiative, educational outreach projects, and we are active advocates on behalf of cat welfare in Ireland. In addition, we provide help, advice, and support about cats to many people via our Facebook page and website. We are all unpaid volunteers and we rely on public donations and our own fundraising efforts to fund our rescue and educational work. Husse is the world’s largest home delivery pet food company operating through 800 Franchise partners in 46 countries.We offer premium and super premium products for dogs and cats in the 32 counties with free home delivery for orders over €30. 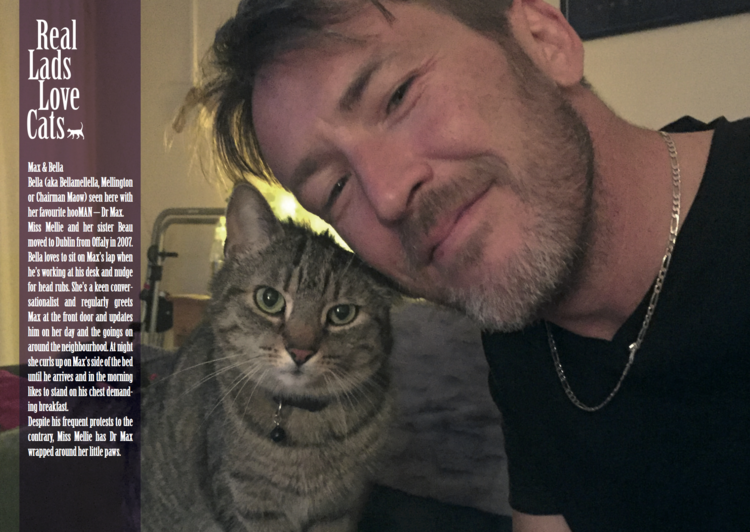 The Last Chance Sanctuary (TLC) is Inspired by Chance the Cat! It is dedicated to the rescue and care of special needs and disabled cats based in West Wicklow. There will be TLC Calendars and Christmas cards on sale at the event. You may also check out their Go Fund Me site to help them with much needed funds. Cat Sitter At Home is a fully insured and Irish registered company. We provide cat sitting, a fully insured cat taxi service for vet visits, nail clipping and other services. Jackie is full time in the business, she has a QQI qualification in Veterinary Assisting and Animal Science. What is TNR (Trap, Neuter and Release) and why do it? She will talk about why do we do TNR, how to do it, the benefits of TNR and the myths surrounding it. Even if you are not involved with cat rescue, but it's a good idea to get informed on what to do if you find a cat or a cat colony. It's a talk not to be missed. Check out Cat Sitter At Home on https://catsitterathome.ie and our full day of interesting lectures at Dublin Cat Fair here. Real Lads Love Cats Calendar Contest! REAL LADS LOVE CAT CALENDAR CONTEST! You ask I answer! 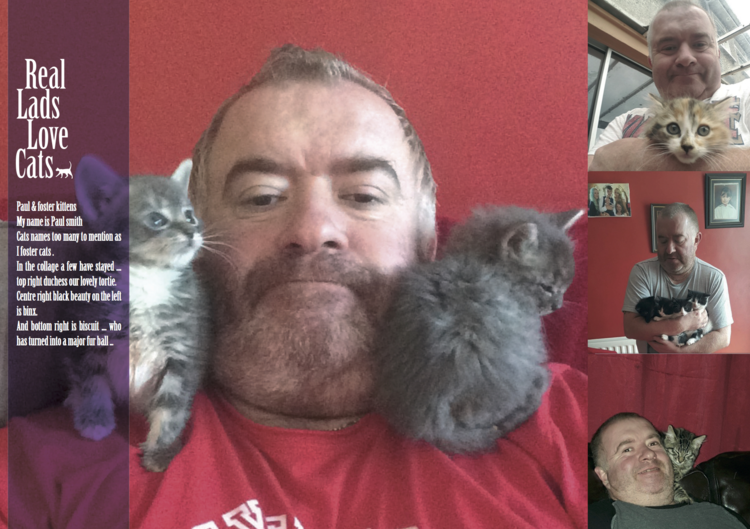 The hugely popular Real Men Love Cat Calendar in America inspired us to do an Irish version of this lovely project. Here comes Real Lads Love Cats Calendar by Dublin Cat Fair! 4. Please tell us your name, your cat's name, your contact number, so that if you win, we can contact you. The winners will get a FREE calendar, and a lot of internet fame! Nominate yourself or the cat men in your lives! Tag a lad who loves his cat(s)! A home visiting veterinary service exclusively for cats in the greater Dublin area. The service is developed for cats, who do not like travelling to the vets, and also for their owners who would rather avoid the stress that this can entail. Julia loves cats, has genuine interest in treatment of cats and empathy with their owners. Julia has the full back-up of the Celbridge Veterinary Clinic and of the fully equipped with the modern surgical and diagnostic equipment Newbridge Veterinary Clinic for patients requiring surgery or further diagnostic investigations. ‘A happy cat is a catnip cat’ is our motto at Fred’s Catnip Farm and they have a mission to provide top quality catnip to our customers so that both cats and owners enjoy the most fun possible. Most cats just love it and every cat will have their own individual reaction. It can make a cat playful, rolling in the catnip and play hunting or it can make a cat completely relaxed and chilled out. This reaction is all due to the Nepetalactone contained in the leaves and flowers of the plant and the strength and freshness of the Nepetalactone is key to your cat’s reaction to it. In order to ensure their product is the very best it can be, Fred's Catnip Farm source top quality seeds. They sow their plants by hand, weed constantly and when the plants are in full bloom, carefully harvest the stems which are air dried before being hand stripped for the leaves and flowers. They never ever use any pesticides or herbicides. Their plants are handled with the greatest of care and they believe this maximises the level of Nepetalactone retained in our catnip. Catnip is the common name for Nepeta Cataria, a perennial herb that belongs to the Mint family. It has similar leaves and the same square stem structure as other mints but is not generally used for cooking. Its main use is as an attractant for cats and it is widely used in cat toys. As it is a natural product, poor handling or long term storage will cause significant deterioration in quality. Nepetalactone can be lost from handling or exposure to light and this will be reflected in lower reactions in cats to the product. Most of the Catnip currently on sale in the UK and Ireland is imported from China or Canada – it cannot be as fresh as those produced locally at Fred's Catnip Farm and the air miles are not great for the environment. Similarly most of the competitors bulk out their products with the stalks of the plant which contain less Nepetalactone and means that they are not as potent as the ones at Fred's Catnip Farm. Dublin's longest standing cat sitting company. Maow Care has been serving cat people by cat people since 2009. Cat sitting, behavioural therapy and workshops, all in one place. Featured on numerous media local and abroad, they are one of a kind cat care company in Dublin.